Downtown Garner is pleased to announce that Full Bloom Coffee & Craft is now open, marking the successful completion of a three-year public-private partnership between the Garner Revitalization Association, the Town of Garner, the North Carolina Main Street & Rural Planning Center and Full Bloom Coffee Roasters. With a $75,000 grant from the Main Street Solutions Fund, this partnership helped local entrepreneurs Patrick and Michelle Byrd renovate a historic building in Downtown Garner that originally housed the first bank of Garner in 1910. The Byrds opened Full Bloom Coffee & Craft, a small cafe with a custom bar area and full seating upstairs, on July 5, 2017 following a two-year renovation. 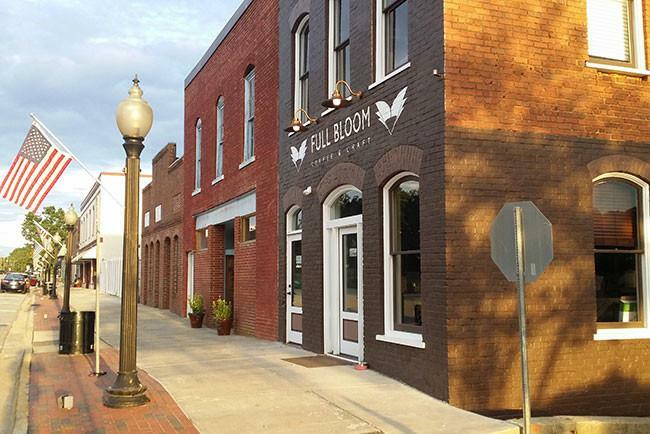 Full Bloom Coffee & Craft is the first Main Street Solutions Fund project to be completed in Wake County. The Main Street Solutions Fund assists planning agencies and small businesses with efforts to revitalize downtowns by creating jobs, funding infrastructure improvements and rehabilitating buildings. Grants support small businesses in North Carolina Main Street communities, as well as designated Tier 2 and 3 micropolitans and counties. Since the program’s inception in 2009, 32 communities have been awarded over $4 million in Main Street Solutions Funds. Full Bloom has leveraged the Solutions Fund to create 3 full-time and 3 part-time jobs and invested an additional $2.46 for every $1 pledged by the state. The Town of Garner worked with the Garner Revitalization Association to apply for and administer the grant during the three-year partnership. The town also committed matching funds from their Façade Grant Program, which is designed to provide financial assistance for improvement projects to the facades of commercial properties in the Central Business District along Main Street in Downtown Garner. “Full Bloom’s café renovation has already had a positive economic impact on our downtown,” said Mari Howe, Downtown Development Manager for the Town of Garner and the Garner Revitalization Association. The Garner Revitalization Association welcomes Full Bloom Coffee & Craft to the historic Downtown Garner business district. The café is currently open Tuesday – Friday from 7:00 am to 3:00 pm and Saturday-Sunday from 9:00 am to 3:00 pm. The menu features espresso drinks using Full Bloom’s locally roasted coffee, bakery items, and pressed panini sandwiches. Full Bloom Coffee & Craft will expand their operating hours once they add North Carolina craft beer to the menu in the fall.